You will look and feel like royalty while wearing this glamorous Flair prom dress 19202. This dress showcases a plunging v-cut neckline with a mesh insert and fitted bodice, flowing into a Mikado made a-line silhouette skirt that will make you feel like a princess along with chic hidden pockets. 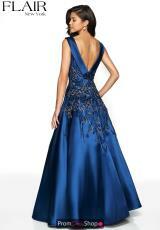 Make all jaws drop as you walk by with beautiful hand sown beading found along the entire back of the dress.